PLAY LEMMINGS ONLINE - It's Free! We are very excited to be able to bring you the free, online version of Lemmings on this page. The HTML5 game above will play on any device and can be played instantly - no download required. Lemmings sold around 15 million copies and has influenced many a game since it's release in 1991. The puzzle-platformer featured cartoon-style graphics that, no doubt, helped to give the game wider appeal. It also featured an icon-based control system, which was still pretty novel in the early 90s. However, it was the whole concept of the game which was simply genius. The idea was to guide a herd (not sure what the correct term is?) of suicidal rodents through increasingly challenging levels, and safely lead each one to the exit. Quick thinking was required in order to stop the creatures from being killed - they could fall off a platform (sometimes off the screen! ), into water/lava or even get caught in a trap. I remember getting into a right old panic trying to frantically figure out how to stop them from walking into danger - these guys just kept on walking, so you had to act fast. Just to make your life even more difficult, there were eight different types of skills that each lemming could possess; climber, floater (they could parachute down using their umbrellas), bomber, blocker, builder, basher, miner and digger. You had to assign one of these skills to one or more lemmings to get them to safety. For instance, if a lemming was about to fall of the edge of a platform, you could assign the floater skill so they could float down to safety with an umbrella. A lemming given the blocker skill would stop the other lemmings in their tracks, and they would have to go back in the opposite direction. Initially, the game was launched by Psygnosis for the Atari ST and Commodore Amiga 16-bit platforms, with 55,000 copies of the Amiga version being sold on the first day alone!. The game proved to be so popular that it was quickly ported to other home computers and video game systems. 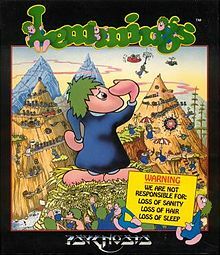 Personally, I played Lemmings on an Atari ST and was just so addicted that I had to force myself away from the screen to go and do something more useful. The Commodore 64 version was the last game to be commercially released for the machine. As the game was developed for the faster 16-bit computers, it must have pushed the C64 to its limits handling all those lemmings at the same time. The game was also released for the Amstrad CPC and Atari XL/XE 8-bit computers. As the game was developed for the 48k ZX Spectrum, it didn't fully utilise the extra memory of the 128k machine. However, the game received rave reviews with 91% given by Your Sinclair and Crash magazines.